The year 2018 began with great optimism about economic growth. As it draws to a close, there are fears of an upcoming recession in the world’s largest economy, the US, and early signs of a slowdown in other large advanced economies such as Japan and Germany. China, too, is expected to have slower growth in the coming quarters, while India’s growth projections have been revised lower by economists and rating agencies. Yet, there is a silver lining for India: Falling commodity prices. Already, the recent fall in crude oil prices—on the back of global slowdown concerns—have arrested the fall of the rupee, and made India’s external sector metrics look less vulnerable than before. So, as we step into the New Year, India’s economic health appears slightly better than it did three months ago. Mint’s Macro Tracker—launched in October to provide a comprehensive view of 16 high-frequency economic indicators—shows that seven indicators are in the green as of November, compared to five indicators, three months ago. Compared to the nine indicators that were in the red then—performing worse than the five-year trend—seven are in the red now. Yet, compared to the start of the year, more indicators are in the red now. In January, only four indicators were in the red compared to seven now. Three of the four sectors tracked—consumer economy, external sector and ease of living—are a shade worse than before. The slight improvement in the past three months has primarily been led by the strengthening of the rupee, which climbed to the green zone in November, having stayed in the red for the preceding four months. The rupee, which had hit an all-time-low in October has appreciated significantly since then, trading at an average of 71.8 against the dollar in November (2.5% higher compared to October) and at an average of 70.8 in December (1.3% higher compared to November), was helped along by declining crude oil prices. The turn in the currency market is also reflected in the Reserve Bank of India’s improved cache of foreign exchange reserves as per latest data. India’s import bill look less threatening now, although slow export growth and steady import growth means that our external vulnerabilities still remain. On the domestic front, there are some signs of progress. There seems to have been an uptick in manufacturing and a recovery in non-food bank credit growth, driven partly by the liquidity squeeze in the non-banking financial company (NBFC) sector. But the consumer economy presents a mixed picture, with tractor sales up and passenger vehicle sales down. Domestic air traffic has also been disappointingly low. The ease-of-living indicators monitored by the Macro Tracker show some improvement with retail inflation falling to its lowest level in the 16 months to November due to exceptionally subdued food inflation. However, the underlying core inflation stubbornly remains in the red zone for the eighth straight month, despite falling 50 basis points to 5.7% in November. A closer look at the data suggests that services inflation, particularly health services, were key drivers of core inflation—more so for rural India. Increasing services inflation in rural India at a time when farm incomes are under strain is a bit perplexing. 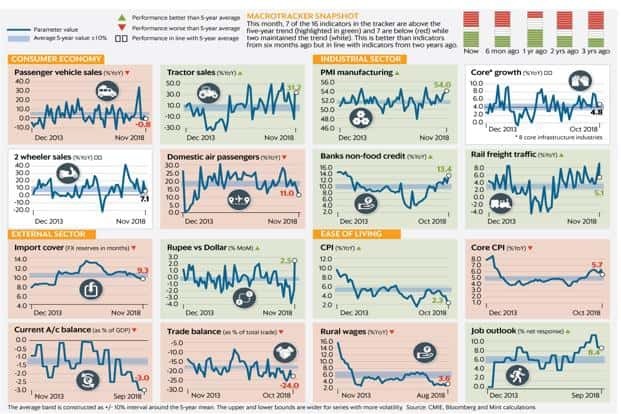 Overall, the health of the economy appears to be a mixed bag with a half-way split between red and green indicators. Key concerns over the next few months will be the risk of extravagant spending at all levels of government as Indian political parties prepare to woo voters ahead of the Lok Sabha elections. Populism could push up inflation and slow down government-led capital expenditure. As a recent note by economist Sunil Kumar Sinha of India Ratings and Research pointed out, states such as Maharashtra, Rajasthan and Karnataka, which had announced farm debt waivers outside the budget have already cut back on capital expenditure spending in an attempt to limit borrowing. Rajasthan and Karnataka reduced their capital expenditure by 12% and 2.5%, respectively, from budgeted estimates, to offset the increased revenue expenditure, but these states still failed to keep fiscal deficit at the budgeted level. In the case of Maharashtra, capital expenditure saw a contraction despite fiscal deficit/gross state domestic product (GSDP) being lower than the budgeted figure . Given that state governments have been the leading drivers of public capital expenditure spending over the past few years, slowdown in investments by states does not bode well for the capital expenditure cycle, or for growth.